Whether it's for a First Communion, Christening or other special event, religious occasion favors give you a chance to spread the joy. 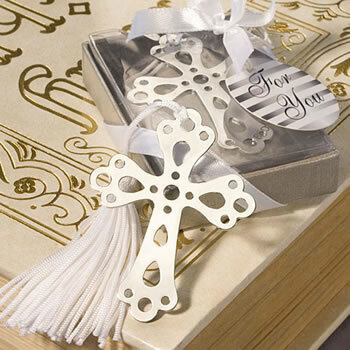 And, these cross themed bookmark favors from Fashioncraft's Book Lovers Collection make a lasting impression. Measuring 5 .5" (including the tassel) x 1 .5", each has a silver metal cross charm with cutout details and an attached white tassel that peaks out of the book for easy page finding. Useful and elegant, each comes packaged in a clear topped box with a silver base, tied with a white satin bow and an attached round "For You" tag with a silver and white striped design. Our order.arrived earlier than expected. The items were pretty boxes and surprisingly beautiful for the amount we paid for them. Great service great product would recommend to friends and family. Only down side was we should have ordered stickers and thought the tag was two sided it, wasn't. Thanks for your great customer service. Received on time and exactly as pictured. Looks good and in very nice packaging. Would order again and good price. I really like them if the size was a little bit bigger they will be perfect.. I loved them. They were perfect for my winter, formal, Christian based wedding! Bought these as favors for our church's 50th anniversary luncheon. Everyone was very pleased with them. Simple and elegant. I love the bookmarkers but I wish that they were bigger. We liked the bookmarks very much. I would have liked it to be a little larger but it will go in a basket along with the Candles we purchased as a welcoming gift to new members in our Church. These bookmarks were beautifully wrapped and packaged. I used them as one of the favors for my sons communion party. I would order them again even though they were a little on the smaller side. They were absolutely adorable. I do think though they were to small to be a stand alone favor which is why I also had hershey bars and a picture frame coaster.